We've been helping kids in the eastern area of Sydney since 1978. Every Friday evening from 8pm till 4am on Saturday mornings, the BOP Minibus is out on the streets of our community. The skilled youth workers who staff the patrol go to the beaches, the parks, the malls, or wherever needed. The BOP Bus and workers are a recognised and trusted source of assistance for young people in the area. Young people who have been assisted by BOP workers in the past will encourage others in their peer group to approach BOP when needing support. BOP workers provide information as requested, including directing young people to helpful websites and information lines. Typical patrols also involve the provision of basic ﬁrst aid, snacks and water. Ensuring the safety of young people is an important activity. This includes providing transport home to vulnerable young people, particularly young girls aﬀected by alcohol or drugs. The safety of the whole community is also a priority. Wherever possible BOP workers will de-escalate potentially violent situations involving young people or contact emergency services such as ambulance and police. The qualified BOP youth worker provides individualised and intense support over a period of time to particular young people with extremely complex needs. BOP is able to assist young people facing risk in situations such as alcohol and drug abuse, violence, sexuality, family breakdown, crime and mental health concerns. Such support can include attending police interviews and court attendances with young people, family counselling or helping a young person connect to specialist services. Because we are not office based and are able to be flexible about where we meet young people and the range of issues we address, we work with kids who are sometimes put into the “too hard” basket. BOP does not oﬀer a "band-aid" or "quick-ﬁx" solution, but really engages with young people facing very challenging situations to help them achieve positive and sustained change. BOP has a particular focus on bullying, including cyber-bullying. We use peer based strategies to address bullying. BOP also provides intensive counselling and support to young people, especially girls, who have experienced significant cyber-bullying. 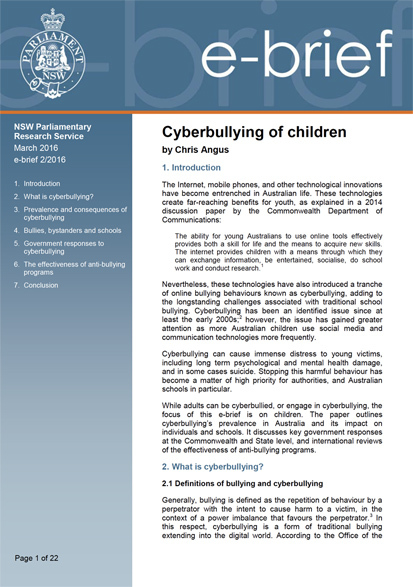 Click on the cover below to download this research paper on cyberbullying of children. We're supported by our local community. Bondi Outreach Project is a registered public benevolent institution and charity with endorsement as a deductable gift recipient. All donations $2 and over are tax deductible. To support the work of BOP, donate now!